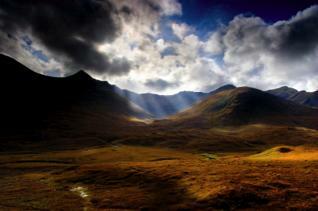 Scotland one of the most beautiful countries in Europe if not the world. Ok I am a little bit biased because I was born there, but nonetheless it is true. But don‘t just take my word for it, come with me on a journey of discovery and see for yourself the delights that await you when you visit my homeland. It is a holiday destination with something for everyone, from grannies to toddlers and every age in between. The attractions are endless, are you a golfer? the game as you probably know was invented in Scotland, and there are countless golf courses, many of them are up to championship standard. Scottish scenery is simply breathtaking, from scenic glens to awe inspiring mountain ranges, clear blue rivers offer salmon and fly fishing, while the mountains are a magnet to those who enjoy climbing or a more relaxed hike or ramble. Because the country is relatively small, with a population of just over five million you can travel from one major city to another in just a few hours, experiencing rapidly changing landscapes and rugged coastlines. To the West of the Scottish mainland lie the Inner and Outer Hebrides. These islands are breathtakingly beautiful and provide their inhabitants with a much more serene pace of life than is often found on the mainland. 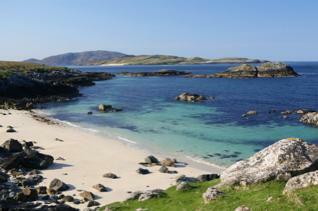 To give you just a taste of the beauty, below is a photo taken on the isle of Lewis. Its vibrant cosmopolitan cities include Edinburgh (its capital) and Glasgow which is its largest city, also Perth, Dundee,Ayr,Stirling, Aberdeen and the "capital of the Highlands" Inverness, which is my personal favourite because I was born there. Its history stretches back many hundreds of years and was often bloody, with clans warring both amongst themselves and with the "old enemy" England. culminating with the battle of Culloden (on the outskirts of Inverness) the last battle to be fought on British soil. The Kingdom of Scotland was an independent state until the first of May 1707, when despite widespread protest across the land, the Acts of Union created the Kingdom of Great Britain. Nowadays it is a thriving forward looking country, whose people are very proud of their history and culture, which has survived despite everything. And they welcome visitors in a way which is uniquely warm and Scottish. Many many traditions speak volumes about this unique country. From Scotch Whisky to Highland Games, the Loch Ness Monster. the Edinburgh Military Tattoo, the Edinburgh Festival, the Scottish Open golf championship, Hebridean Celtic Festival, and the list just goes on and on. I make no apologies, simply because I passionately believe it to be one of the most outstanding destinations in the world (I am an exiled Scot who has traveled quite a bit). So if you are planing a trip to my homeland don`t delay to long, the sooner you go the sooner you can go back like so many thousands of others, one visit is never enough to experience all Scotland has to offer.